The first step for making the bird trap is to build the housing. For simplicity, stick to a rectangular box design. A rectangular box design is easy to build and has minimum corners. Minimum corners give trapped birds more space inside. This design is easy to clean. If you have several of these rectangular bird traps, then they're also easy to stack and store. 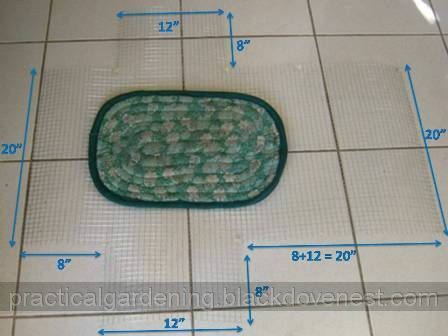 Since you have a large piece of wire mesh screen, you can maximize the use of the material by cutting a box pattern for the bird trap housing. A simple and common box pattern is the t-shaped pattern (that's a small letter "t"). 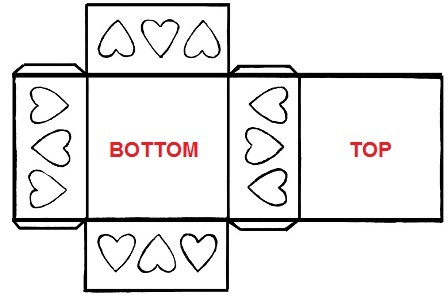 Shown below is a box with three hearts on each of the sides. The t-shape pattern already connects all 6 panels (Top, Bottom and the 4 sides) so you don't need to cut the panels separately and then fasten them. You simply fold the solid lines to pull all panels inward and you end up with the box. As in the pattern above, you would need allowance for flap material that will allow you to fasten or bind the edges of the panels together. It's a challenge to work on the wire mesh screen material if newly purchased from a roll at the hardware store. You will need to "reverse roll" the sheet of screen that was purchased. You take one end of the sheet and roll it opposite to how it was rolled in the store. You may have to tie the roll up with a piece of string or rope just to keep it from unrolling. Keep it reverse-rolled. Unroll the sheet and work on it the following day. When the screen sheet is reasonably flatter, lay it on a flat surface. You may need to keep it flat with some rugs or door mats. Layout the t-shaped box pattern on the screen sheet by using pieces of masking tapes. It may be impractical and useless to use a pen marker on the screen sheet because it's hardly visible on a shiny surface. 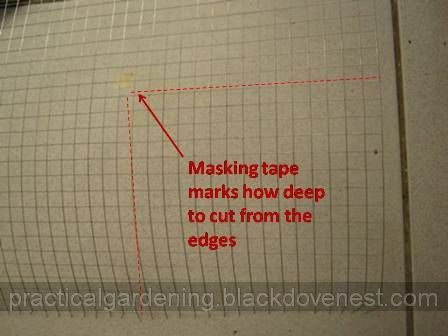 The pieces of masking tapes on the screen sheet can be positioned on the corners where you will make the cuts. The photo below shows how a piece of masking tape may be positioned on the screen sheet. The two dotted red lines going toward the masking tape show where to cut from the right and bottom edges. 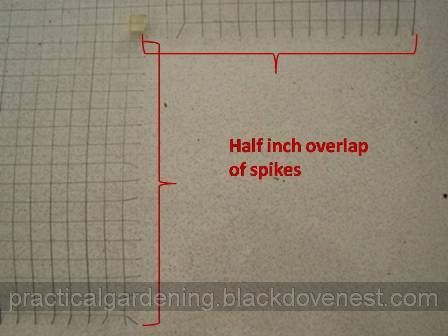 Use a wire cutter to cut along the dotted lines. Be sure to leave the spikes (a 1/2-inch overlap) that will be used to fasten the box's panels together. 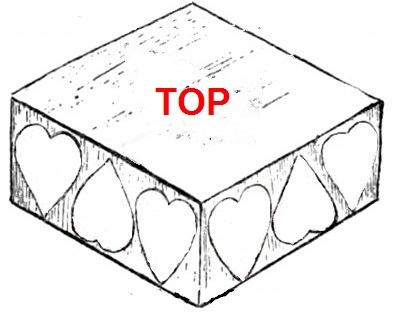 Use the above procedure for cutting the entire t-shaped box pattern for the bird trap housing. Length = 20 inches, Height = 8 inches, Width = 12 inches. Be very careful when cutting and moving the screen sheet around. Wear gloves if you have to. The exposed spikes, though small could easily scratch skin. After cutting, the t-shaped box pattern should appear below with the correct measurements. The 20-inch piece on the right is composed of the rear panel's height (8-inches) and the top panel's width (12-inches), for a total of 20 inches. 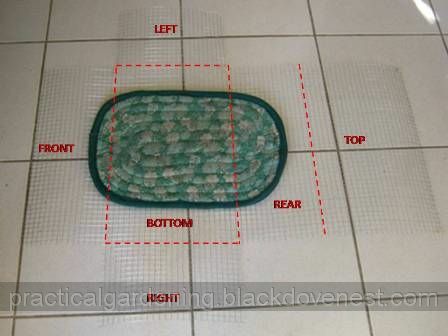 In the above photo, I placed a doormat to weigh down and flatten the screen sheet. Put aside small pieces of screen material that were left by the cutting. They will still be used for making the bird trap funnels, access door and guard rails. Using the same photo above, fold the box pattern along the fold lines indicated by dash lines as shown below. The photo below shows the Top, Bottom, Right, Left, Front and Rear panels that will be formed when the box is successfully folded. To help you fold cleanly, use a long and rigid straight edge like a long metal ruler or a carpenter level. Position straight edge along the fold line. Press the straight edge firmly against the screen sheet on the floor. With the pressed screen sheet immobile, raise the panel to be folded. In the photo below, the left holds a carpenter's level firmly pressed against the screen sheet. The right hand is then able to raise the panel on the right in the direction of the blue arrow to create the fold. After folding all the panels along the designated folding lines, the bird trap housing should now be formed as shown below. Be sure all the box's folds are evenly creased so you end up with a regularly shaped rectangular box. Here's the front view of the bird trap housing. With the bird trap housing box properly formed, you're now ready to fasten the side panels together that will result in a rigid box. For this you would need a pair of slip joint pliers and diagonal cutting pliers. Position the overlapping panel spikes against each other to form the edges of the box. Twist the wire spikes of both panels, one pair at a time as shown below. Cut the excess portions of the twisted wires with the diagonal cutting pliers. 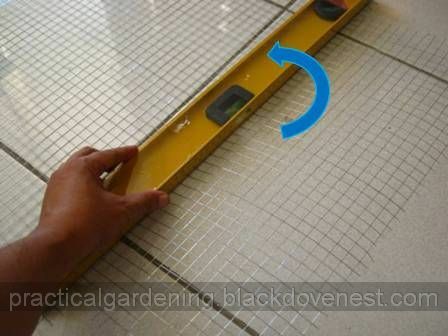 Try to keep the cut as flush to the edge as possible to remove protruding wires. Use a small portable sander if preferred. Do the above to fasten all side panels together (Front, Rear, Left and Right). Do not, however, fasten the Top panel yet. The top part of the box needs to remain open to allow you to add the funnels and guard rails inside the bird trap. Warning: Do not close the Top panel until all the bird trap's accessories inside are completed and installed. To close the bird trap, fasten all three edges of the Top panel with the edges of the Left, Right and Front panels. 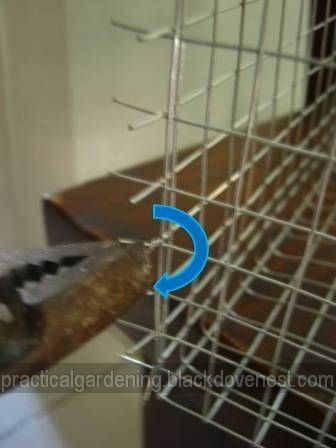 Using a pair of long-nose pliers, bend the Top panel's spikes as shown below. Unlike the side panels, the spikes of the Top panel could simply be bent (no twisting and no further cutting required) to attach to the rest of the panels.